02-585 Warsaw is a collection of images taken at the “Obrońców Pokoju” allotment garden in Warsaw, Poland. The gardens were originally built to give train workers who lived in the city and who couldn’t afford to go on holiday a green place to go to escape the city. Originally built on the periphery of the city, many of these gardens are now almost in its centre due to rapid expansion and developed. The “Obrońców Pokoju” is in a district popular with families just south of the centre and is now surrounded by tenements, small green space in an otherwise artificial landscape. The land the allotments are built on is now considered very valuable, and many are under threat from developers who would like to build on them, destroying more of the city’s green space, as has already happened with other allotments. Many of the gardens are still owned by the same families who were originally given the space, and are still used as a way to escape the city noise and pollution. Unlike British allotments, the allotments aren’t used to only grow fruit or vegetables, but as a place to relax with a small hut, a lawn and often a flower garden. They are way for people who live in high-rise flats to have the type of garden that we take for granted, and just like our gardens they used also as a way of self-expression (sometimes competitively), and many of the huts are elaborately decorated and usually painted with delicate pastel colours, which give the place a slightly surreal air surrounded as it is by bleak, featureless and often grey communist-era tenements. They have also become important areas of biodiversity and a haven for birds, bees, butterflies, hedgehogs and other small animals otherwise deprived of living space in the city. A few years ago, I lived near the allotments and would frequently visit them, just wandering around its avenues and streets, so when I found out last year that the city council, along with developers, planned to demolish the gardens1 and build a new “park” (and flats) that they claimed would be better for local families and kids, I decided to finally take the series of images I had been intending to take for years. 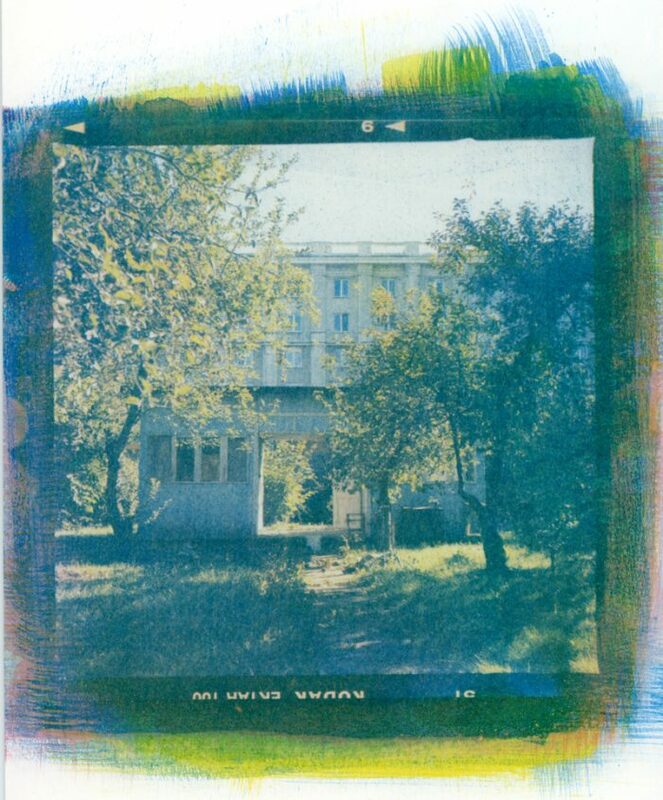 The original images were taken on an analogue stereoscopic camera, and for my time at 1a Inverness Place I’ll be making a series of gum prints that will later be shown at the gardens in Warsaw with Sam Rozkwit (instagram @sam_rozkwit), an art group who promote the use of the allotments and urban gardening in the city. Gum printing is a traditional photographic printing technique that uses gum arabic, watercolour paint and dichromate, which when exposed to uv light through a negative creates a positive print, and using several b/w negatives (printing multiple layers of colour) it’s also possible to create a full colour print. Because the process uses watercolour paper and paints, the final images usually have a delicate and textured quality not possible with other colour printing process.